If you'd like to see my video review, you can see that here, or click this link to watch directly on YouTube. Read on for the best Sapira Mattress Review . . . Mobile User? Click Here to watch the video directly on YouTube! We have spent the last 70 days (roughly) trying the Sapira Mattress - a newer offering in the online-only mattress space, which is "Created by dreamers, and built by experts for connoisseurs of life" (trademark!). Well, that sounds pretty fancy . . . would it live up to this slogan? The Sapira Mattress comes in a spiffy black box. Sapira is made by the Leesa company and is the hybrid cousin of the very successful Leesa Mattress. They bill the Sapira Mattress as "the first luxury pocket spring and performance foam (ie, Hybrid) mattress delivered in a box." It is 100% made in the USA. The 100 night in-home trial period (with a full refund if you don't like it) & free shipping gives you the ability to try it out risk-free. There is only one firmness level. Although the company does not say exactly what the firmness level is on their website, they state that it has "bounce when you need it, support when you don't." 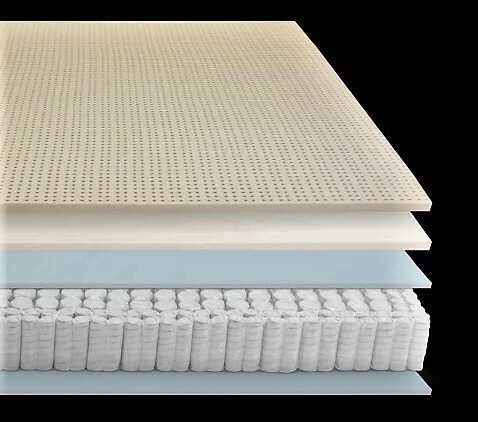 In an email with a customer service agent from Sapira, I was given the following information: "Based on our materials and customer feedback, the Sapira mattress ranks as a 7 out of 10 on the firmness scale, providing a responsive sleep surface that reacts to your body as you move and adjust positions." I love the diamond-shaped pattern on the cover! It feels so soft and nice. So . . . with the introductions out of the way . . . time for the rankings!!! I will rate each category on a 5-Star Scale, where 5 is the best. The Sapira mattress is very heavy! The queen weighs over 115 pounds. I say this as a (mostly) good thing, as I think that means the quality of the foam layers is high and of a proper density, and the springs are solid. It does come across as a high-end product based on "look and feel." There's no cheaping out that I can see. 100% made in the USA. The cover is very nice looking and well formed, and seems expensive. I found no flaws. The tag is classy. The cover is made from one solid piece of material, with a zipper that would allow you to remove the cover if desired (although they do not recommend machine washing). Because the pocketed coils go right to the edge, the edges don't feel quite as nice to the touch as it would if you had foam encasement (though I think this helps in the support area), but that's no big deal. As with any hybrid mattress, it's a bit difficult to control and move the mattress from room-to-room, but it stays in place on the bed perfectly. There is no noise. None. There was no off-gassing or chemical smell, but the "new mattress smell" did last about 4-5 days after the unboxing. Admittedly, I did not allow for any designated airing out time and put on the mattress protector and a sheet & slept on it the first night. If I could give more than 5 stars, I would. The feel is amazing! Words like luxurious, pleasant, tactile, and comforting come to mind. I don't know what the cover is made out of, but it has a bunch of little diamond patterns. It's not tufted (it is still a "tight-top"), but you can feel these little diamonds with your hand through the sheet. I don't do it justice here, so watch my video review where I try to describe how much I like the feel of the cover! 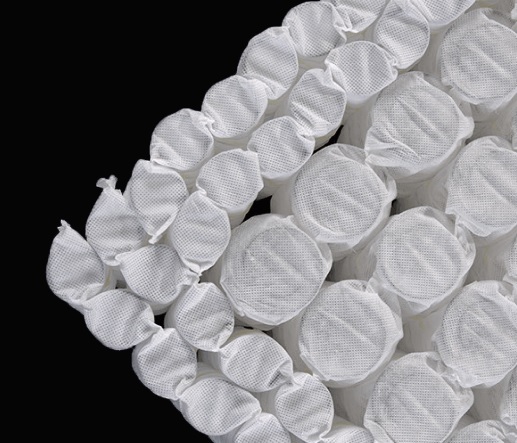 Note with the Sapira you should be using a thin, flexible mattress protector. 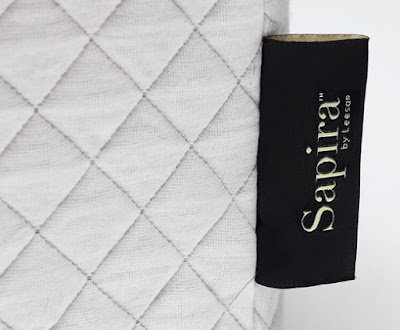 If you use a quilted protector, you are actually taking away from one of the best aspects of what Sapira brings to the table. There is some motion transfer across the surface of the mattress, but not all that much. I change positions frequently, and my wife, Debbi, said I didn't bother her during our time on the Sapira. "Support" does not mean the same thing as firmness. This gets into tricky-to-describe territory, but means things like keeping your spine in alignment. Does the firmness feel even, as opposed to lumpy or firm in spots without being firm in other spots? This is always subjective. I am a back sleeper primarily but also sleep on my side some. Sapira shines brightly in the support department. When they say, "bounce when you need it, support when you don't," they mean it. The support goes all the way to the edge. You can see in the pictures that they use more tightly packed coils along the edge so you can sleep all the way to the edge just fine. It's also a bed you can sit on super easily, and get in-and-out of with ease. The top layer (somewhat bouncy, and hole-punched to stay cool) is something akin to latex - though not actually latex - as it is just bouncy enough, but can also give way to allow your body's curvature to be maintained. The Sapira Mattress provides 5-star support. I need my hips and shoulders to sink in some, but not too much. Sapira does well here. I held back from giving 5 stars because they only offer one firmness level; there is no choosing between "soft, medium, or firm." It would be cool if you could choose where you want to fall on that scale. What am I looking for in conformity? I want something that feels firm where it's supposed to feel firm, and soft where it's supposed to feel soft. That's a tall order (or a $5,000+ mattress), but let's at least get as close as we can. I want something that conforms to my body locally, but not globally. In other words, I want to sink into my mattress just a bit -- maybe an inch or two, but I don't want a giant valley to be formed while the mattress tries to accommodate my whole body. The goal is a happy medium between sinking in and floating on top. This is a big deal for us because I weigh quite a lot more than Debbi. Sapira again did very well here. It was almost perfect here -- if the conformity was just a hair more sensitive, I would have given 5 stars, but, then it likely would have lost some of it's bounce, so it's got to be a compromise thing. tightly packed near the edges for enhanced support. There was no unwanted rolling (she didn't roll into me during the night). The conformity is mostly "localized" but does not spread across onto her side of the mattress. This is something of a preference item as well that will vary from person to person. I didn't ever have a need to call the company, but I did email a couple times. The first email I sent took about 5 business days to get a reply, which is a little longer than I would prefer, but after that it was faster. Sapira piggy-backs on the good reputation of the Leesa Company, which has been around for about 4-5 years. I didn't spot any horror stories online about the return process, they all seemed fairly smooth. I don't give a star-rating to shipping, but it's worth mentioning that shipping is free (as long as you are willing to set it up yourself). It is delivered by UPS or FedEx, it took about 4-5 business days from order to arrival in our case. It comes in a box, compressed. If you want, you can pay an extra $99 for "white-glove" delivery -- in other words, someone will set it up for you on your bed and take away the box, plastic, etc. There is no cost to you if you decide to return it during the trial period. The Sapira has a 10 year warranty. The warranty, I noticed, kicks in with 1 inch or more of sinkage or indentations. This is better than most (most warranties only kick in with 1.5 inches or more). There is no proprietary foundation, you can place Sapira on any solid surface, a sturdy foundation, or a bed that comes with slats like a platform bed (make sure the slats are no more than 3-4 inches apart). I have been using Sapira on the Zinus Low-Profile foundation, which I reviewed separately. The representative from Sapira told me that this particular foundation would "work fine" and it does. - Somewhat difficult to move the mattress around (for example, when rotating or moving to a new room) as it is quite heavy. The Leesa Company has found a niche with the Sapira, offering a high-end hybrid mattress at a price that gives them a clear edge over traditional in-store competitors (though on the top-end of the bed-in-a-box market). Call it the Audi of the bed-in-a-box world, but at Kia prices! I can wholeheartedly recommend Sapira. Bear in mind that in general, you get what you pay for. If you choose to invest in a Sapira mattress, I think you'll find it to be worthwhile. And, with a 100-night in-home trial, there's no risk. 100 nights is more than enough to decide if it's for you or not. Of course, you have to be someone who is looking for a certain feel or style. Looking for some of the benefits of an all-foam mattress, but don't want to feel quite so "sunk?" This is for you. Or, maybe you want something that is supportive and firm while still allowing for a fair degree of pressure point relief? Here you go, you found it. If the biggest flaw is that they only offer one firmness level, that's not too bad. Debbi and I paid full price (with a $150 discount - at the time, that was the discount for everyone) for our Sapira. 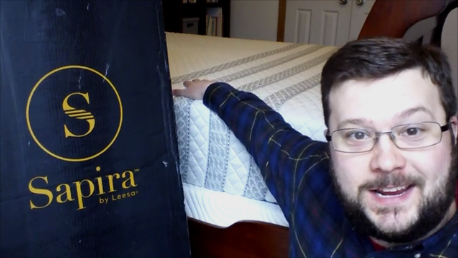 Even though my blog and channel are starting to gain a little attention, and I will be reviewing more mattresses moving forward, I'm guessing my Sapira will be very hard to beat. Another note is that for every 10 Sapiras purchased, the company will donate one to charity. As far as I have seen, Sapira (their website here) always offers a discount off your Sapira purchase. (As of 12/27/2018, the discount is around $230) This link (and any on this blog post) automatically includes the current best discount! The first number is the "raw price" and the number in brackets is the net price after the current discount. You can now also view or buy a Sapira Mattress on Amazon! - click here! What do you think? Feel free to share any comments! If you have questions, feel free to ask and I will try my best to answer. The Sapira has top-notch edge support. I paid full price for my Sapira. We bought our Sapira because we wanted to try it out just like anyone else, but, several months later I was offered a chance to participate in their affiliate program. I will earn a referral fee if you buy (and keep!) a Sapira. Other links on this blog are considered to be "affiliate links" as well (such as the links to products through Amazon) and I am paid a referral fee if you click one of these links and subsequently make a purchase. This costs you nothing. All opinions are my personal reviews and preferences, and do not represent the opinion of any particular company. Thanks for your consideration. Very helpful. I just returned a hybrid bed as I was very sensitive to the smell the bed had and nobody else seems to have had concerns. It was a great bed though. It too was a hybrid but came boxed vs rolled. I may take a trip into NYC to see the Leesa and this Sapira. Did you have any odor issues with the bed? I did not have an "issue" with the smell. There was no off-gassing or chemical smell, but there was the (common) "new mattress smell" for about 4-5 days after the unboxing. Now, admittedly, I wanted to sleep on it right away (it was already late evening when I unboxed it) so I put a mattress protector and sheets on immediately and slept on it. I would strongly guess if I had aired it out for 2-4 hours before putting the bedding on, that smell would have gone away in half the time. We are still sleeping on it for our "every night" mattress and it is great. After 5 days or so, no smell at all. I am coming at this as someone with mild allergies and moderate asthma, so I am about a 7 on the scale of "smell sensitivity" (where 10 is the most). I was looking at the regular Leesa and then heard about this. I like that it has good edge support - the Aviya I had had excellent edge support and was very comfortable. But after 2 months I could not get past my issue. It's amazing how some folks feel a bed is so hard as to be unbearable and another loves it. Beds are so subjective - makes dealing with reviews difficult when there is no retail store to check with. I wish there was a review that said, Bed X is just like the Temperpedic or whatever's model so one could check it out. Foam concerns me as I do not like my old pillow top due to that getting stuck feeling. That's why I tend to gravitate to a hybrid that has some innerspring feel. 4. I value edge support. I do not feel the coils when sitting on the edge of the bed. For reference, I am a bit over 200 lbs. As far as I have experienced, you only "feel" the coils from the side, like if you run your hand along the edge of the mattress. Really no reason I can think of why anyone would do that, though, in the normal course of life. I was hoping that would be the answer! Thanks again.